Prelude in “NO”: Learning to tell your children “no” will benefit them for a lifetime. They won’t like to hear it; after all, they have a mind of their own and your “no” reminds them they can’t do everything they want to do. Still, they need your “no.” They lack the experience and knowledge to make wise choices in many situations. They need your “no” to set the limits and boundaries of safety. They need your “no” to promote their healthy physical, emotional, and spiritual development. They need your “no” so they can learn to say “no” for themselves as they become more independent. Fugue in “NO”: Saying “no” effectively is built on at least four foundational themes. Theme #1: children deserve our respect, even when we have to set a limit. No need to scream and yell, name call, or intimidate and threaten. Instead, remain considerate and respectful when saying “no.” Theme #2: learn to say “yes” as well as “no.” Effective “no’s” are balanced by “yeses.” Theme #3: effective “no’s” are based on values rather than the arbitrary mood of parents. They promote safety, health, and respectful interactions. 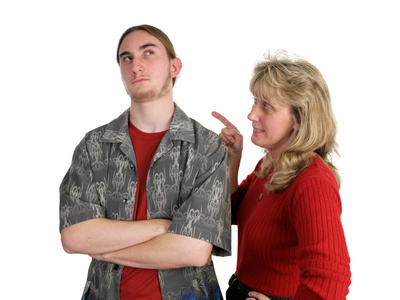 Theme #4: parents communicate a good “no” with their voice, body, and facial expression. Master “the look,” the “polite but firm voice,” and the “strong but loving stance” with your “no” and each will come to speak “no” alone as well. Variations on “NO”: You can communicate “no” in a variety of ways. In fact, the more ways you can say “no,” the more effective your “no” becomes. Let’s expand on the simple theme of saying “no” with a few variations. Add touch to your “no.” Put your hand gently on your child’s shoulder when you communicate “no.” Hold their hand while you say “no.” Gently move them away from the object of “no” and toward some other object or activity. Touch is a powerful tool in making your “no” effective. Add eye contact to your “no.” Make sure you and your child look at each other when you tell him “no.” Let him see the love and concern in your eyes. Look for the understanding in his. Change the setting. Rather than simply saying “no,” move to another room. Leave the area or redirect them to a different area. For instance, change the setting from inside to outside when the behavior gets too active or loud for inside. Add a “yes” to positive substitutes. “No, you can’t have a cookie but you can have an apple.” In this way, you can redirect your child to a different and more positive behavior. This variation will help your child learn to accept a “no” and seek a positive alternative to meet their needs. Practice this Prelude, Fugue, and Variation in “NO” and you will hear your “no” become increasingly more moving and effective.